The meeting was initiated by Israel Chamber of Independent Organizations and Businesses, according to a report by the Israel Diamond Institute. 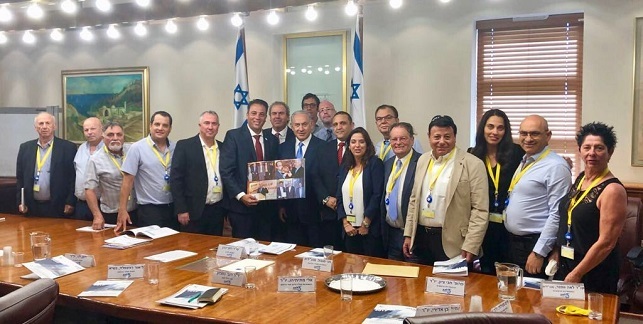 Dvash and Netanyahu spoke about the state of the Israeli economy in relation to the challenges faced by the independent organizations and businesses in the country. Dvash commented on the meeting, saying, “As in our previous meetings, I met an attentive listener who is familiar with the challenges of the industry and the things we need to succeed. “As a general rule, we try to have frequent meetings with decision-makers at the highest levels with the aim of promoting our industry and engage the Prime Minister’s assistance in driving the growth and development of the industry,” Dvash added. Photo Credit: Israel Diamond Manufacturers Association.